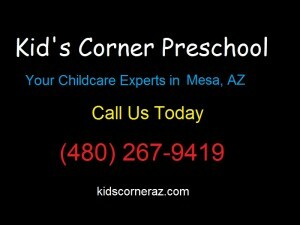 If you want your child to get the most out of their formative years, it would be wise to enroll them in a preschool in Mesa. You probably haven’t given it much thought, but there is something magical about preschool. Preschool is where your child gets to step out of their comfort zone for the first time . This is when for the first time they have to stay away from their parents. The right Mesa preschool is designed to make the children ready for the future. A playschool should be a place where your child feels like home. There are several preschool activities that help in making children feel secure and comfortable. Preschool is the place where children learn to make friends and communicate easily with people. It helps in developing your child’s foundation that will help your child to succeed in life. Children who have attended preschool often have better self-confidence. The preschool learning activities help in improving your child’s social skills and get better grades.Preschool provides an opportunity to the kids to learn in a playful environment. With that said, let’s have a look at all the benefits of preschool education for the kids. Preschool provides a good head start to children heading for kindergarten. Kindergarten is where the child learns the basics. Children here are taught in a fun way through preschool worksheets that aid in learning as well as their development. Children get to develop their social and communication skills. The kids get to interact with children of their age and with their teachers in a structured environment. The kids learn to make friends and play with them. A Mesa preschool provides the opportunity to the children to take care of themselves. Children get to learn the importance of time and the things that should be done on time. Children are taught how to wash their hands, keep their toys in a proper place after playing. In some schools, children are toilet trained too. Preschool provides an opportunity for advancement. Preschool provides the children the opportunity to learn to follow instructions and even learn to share. The teachers help the children in understanding what they will learn in kindergarten with the help of kindergarten worksheets. You want to give your children every opportunity. One way to stop is to enroll them in a preschool in Mesa.